IEEE 802.16j multi-hop relay network systems provide the mobile wireless communication environment. In such network systems, the handover scanning procedure allows a mobile station (MS) to obtain the information about the handover target base stations (BSs) or relay stations (RSs). The network systems need more time to negotiate the association parameters and to handle scanning the BSs and the RSs when the number of BS and RS increases. It results in more overhead for the handover scanning procedure. In order to accelerate the handover process and reduce the transmission interruption, efficient handover scanning procedure schemes and corresponding algorithms must be developed and designed. A novel relative angle computing algorithm is proposed in this article to accelerate the handover process by taking into account the moving behavior of the MS, and the distances among the MS, the RS, and the BS. The main idea of this algorithm is to reduce the management information overhead and to estimate the potential moving path of the MS in the wireless mobile communication networks. By using the proposed scheme, we eliminate the unnecessary associations and scanning intervals, and reduce the handover scanning procedure efficiently. Simulation result demonstrate the superior performance of our proposed scheme and its ability to strike the appropriate performance in the handover overhead and the message delay for IEEE 802.16j multi-hop relay network systems. IEEE 802.16 Broadband Wireless Access Systems, also refereed as WiMax (Worldwide Interoperability of Microwave Access), is designed to evolve as a suite of air interface for fixed, portable, and mobile wireless access systems. This standard is a promising technology to support high transmission rate and predefined quality-of-service (QoS) framework in the broadband wireless networks. This technology can provide a cost-effective broadband access solution to use for connecting local area networks to the Internet and to support mobile applications such as fourth generation mobile systems . IEEE 802.16j multi-hop relay network specifies a system for combined fixed and mobile broadband wireless access environments . This standard provides a mobile environment for the mobile stations (MSs). In such system, the MSs can send their data directly to the base station (BS) or use some relay stations (RSs) to relay their data to the BS. The coverage of the system can be enhanced and more MSs can be accepted in the system. Because the distance between a pair of communicating station is shortened, it reduces the power consumption, path loss, and enables communication at higher data rate. Figure 1 illustrates an example of IEEE 802.16j multi-hop relay system model. The places of RSs depend on realistic environments such as the shadow of buildings, valley between the buildings, and the coverage extension at the cell edges. However, the additional handovers occur in a multi-hop cellular network between the BS and the RSs or between two RSs. The network systems need more time to negotiate association parameters and to handle scanning BSs and RSs when the number of BS and RS increases. It results in more overhead for the handover scanning procedure. The long interruption of hard handover (HHO) is serious for the packet delay sensitive applications. In order to accelerate the handover process and reduce the transmission interruption, efficient handover scanning procedure schemes must be developed in an IEEE 802.16j multi-hop relay network system. IEEE 802. 16j multi-hop relay system model. Several researches on the relay issues have been conducted in IEEE 802.16j multi-hop relay network systems. With respect to the relay selection issues, Ann et al. propose a path selection method considering the link available bandwidth, signal-to-noise ratio (SNR), and hop count in non-transparent mode of IEEE 802.16j. This scheme only suggests a suitable path for the new RSs and it does not consider the mobile environment for the MSs. Ge et al. [4, 5] analyze the relay selection in IEEE 802.16j multi-hop relay vehicular networks. An analytical model is developed in this article for locating and selecting the RS based on the locations of MSs. These two articles only consider a transport system with the highway mobility pattern. An effective path selection metric for IEEE 802.16j multi-hop relay networks is proposed in  to improve the network throughput. 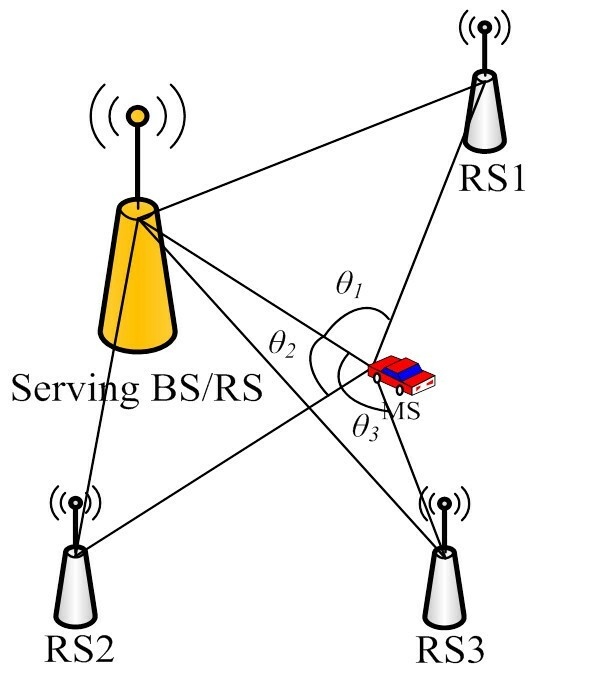 The authors use an effective radio resource index to calculate the cost function and determine the relay path between the BS and the MS. Shih et al. 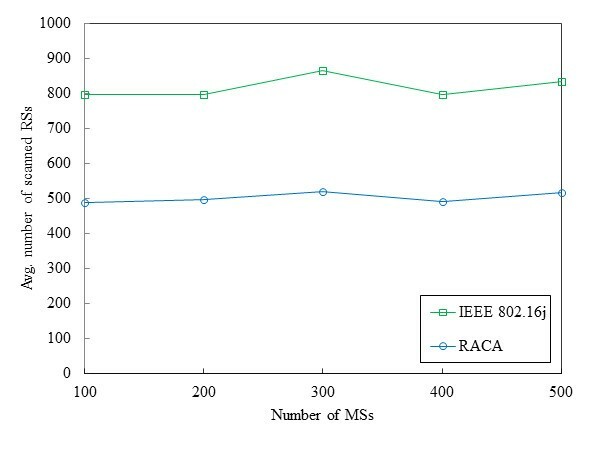 propose a high spectral efficiency and load-aware metric for the path selection in IEEE 802.16j multi-hop relay networks. A comprising function is developed in this article to formulate the path cost to evaluate the possible relay paths and improve the network throughput. Previous schemes described above do not take into account the problem in the handover process with respect to QoS guarantees for the MSs in an IEEE 802.16j multi-hop relay network. These previously developed schemes ignore the discussion of the handover overhead and message delay for an MS. They only emphasize the network throughput enhancement. Several handover techniques have been proposed to support QoS provisioning in IEEE 802.16-based systems. With regard to the handover issues in IEEE 802.16e network systems, analytical models have been proposed in [8–13], which have been validated to some extent through simulations. Nevertheless, only a few research articles have studied handover issues in IEEE 802.16j network systems. A reducing inter-cell handover events (RIHE) based on cell id information in multi-hop relay system is proposed in  to decrease handover signaling overhead, latency, and unnecessary handovers. The authors propose a handover method that reduces inter-cell handover but increases intra-cell handover events by modifying the BSID format into the hierarchical BS/RS ID. Becvar et al. propose an optimal handover scanning procedure (OHSP) in IEEE 802.16j network systems to reduce the management information overhead and to maximize the user data throughput. The modification of scanning procedure is based on the uplink direction by adding identification addresses of all recommended stations for scanning into one scanning request message. 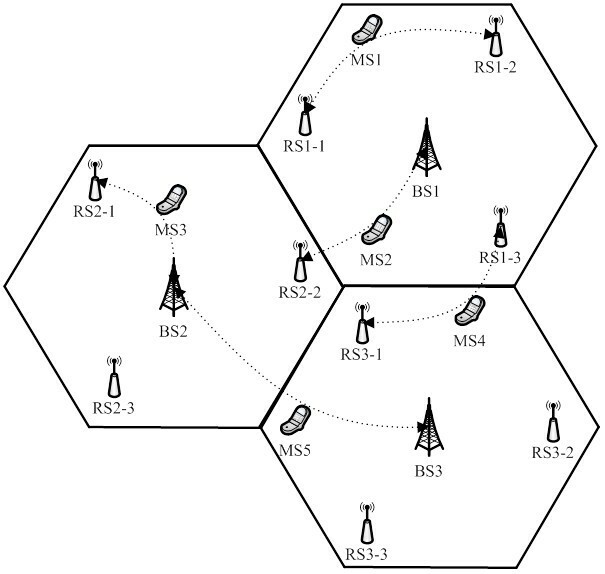 In , this article presents handover schemes in multi-hop cellular networks (HSMCN) where RSs are located either inside a cell or on the boundary between two adjacent cells. By deploying RSs on the boundary between two adjacent cells, the service-interruption time caused by inter-cell handover is reduced. Yun et al. propose a fast handover scheme (FHS) to reduce the handover signaling cost and to decrease handover delay by applying fast handovers for mobile IPv6 (FMIPv6) to IEEE 802.16j networks, which determines the cross-subnet handover in advance through the interaction of MAC layer messages. Sultan et al. perform simulation study of three handover techniques (SSTHT) within the IEEE 802.16j standards and prove that the macro diversity handover (MDHO) outperforms the HHO and fast base station switching. MDHO is the process by which an MS maintains connection with two or more access stations called a diversity set. In , a topology-aware macro diversity handover technique (TMDHT) is proposed to improve the conventional MDHO. These previously developed schemes [15–17] described above do not take into account the moving situation of MSs. Due to users’ mobility and insufficient bandwidth in the mobile wireless networks, it is important to provide QoS guarantees such as the message delay for an MS in IEEE 802.16j systems. From the point of view of mobile user, the message delay is obviously undesirable and very inconvenient, so the mobile users are not tolerant of this problem. Unsatisfied mobile users may change to the competing system. Hence, it is important to accelerate the handover process in IEEE 802.16j multi-hop relay networks. The message delay becomes the most significant QoS factor in such networks. Therefore, the performance parameters of interest in this article are the handover overhead and the message delay. Motivated by the above discussion, in order to reduce the handover scanning procedure efficiently, it is important to consider the users’ mobility. There are several parameters that directly affect the users’ mobility: geographic topography (e.g., roads, streets, and lanes), transportation way (e.g., railway, freeway, and highway), common and personal habits (e.g., go to work, go back home, and go shopping). In most cases, the trajectories of users are foreseeable. In the proposed scheme, we take into account a more realistic environment of random movement of MSs in IEEE 802.16j multi-hop relay network systems. 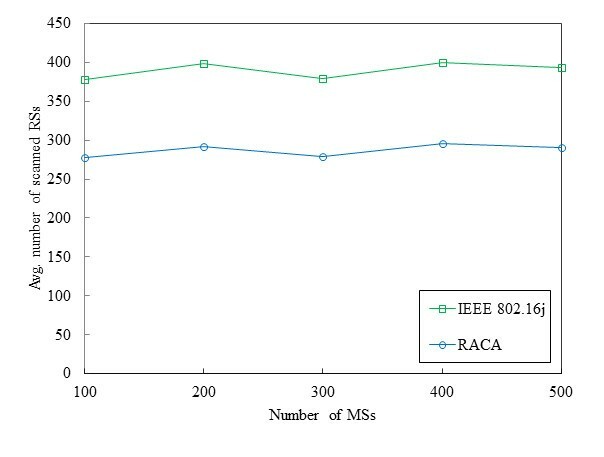 We propose a novel relative angle computing algorithm (RACA) in this article to estimate the potential moving path of the MS by taking into account the moving behavior of the MS and the distances among the MS, the RS, and the BS. The global positioning system (GPS) is not employed in our proposed scheme because the mobile devices do not necessarily have the functions of GPS. Based on the existing network conditions, the proposed scheme makes an adaptive decision. Thus, our proposed scheme has the ability to provide more efficient control over network condition fluctuations. In addition, our system takes into account environments encountered in practice, and to test its response different number of RSs and MSs that are simulated and discussed in this article. This is important for evaluating the handover overhead and message delay performance. By using the proposed scheme, we eliminate the unnecessary associations and scanning intervals, and reduce the handover scanning procedure efficiently, while providing better QoS for mobile users in an IEEE 802.16j multi-hop relay network system. Table 1 summarizes a comparison of the handover methods proposed in the IEEE 802.16j systems. The rest of this article is organized as follows. In Section 2, we present the system model of IEEE 802.16j multi-hop relay networks. In Section 3, we illustrate the proposed scheme in detail. In Section 4, we present our simulation model and analyze the comparative evaluation results of the proposed scheme through the simulations. Finally, some conclusions are given in Section 5. In this article, we consider a mobile wireless network with a multi-hop relay network infrastructure. The system infrastructure is composed of BSs, RSs, and MSs. IEEE 802.16j multi-hop relay network system allows one or more RSs to be deployed between the BSs and the MSs for extending the coverage and enhancing the performance of the network. 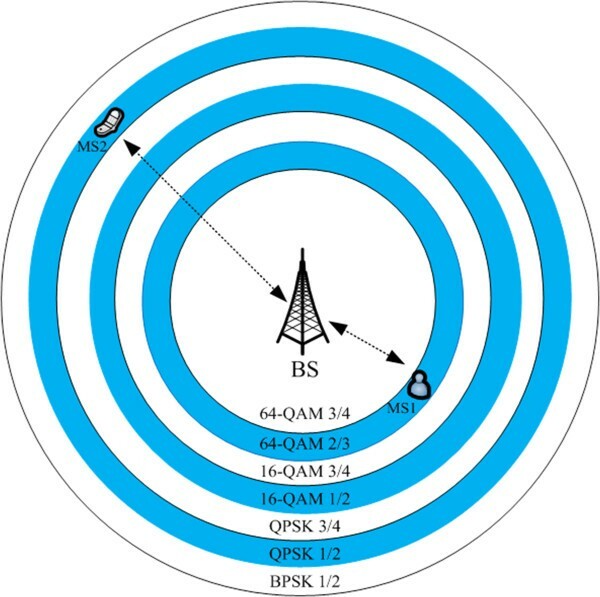 The BS is directly connected to the wired backhaul and is equipped with sufficient intelligence that handles all the routing and connection issues in the cell. 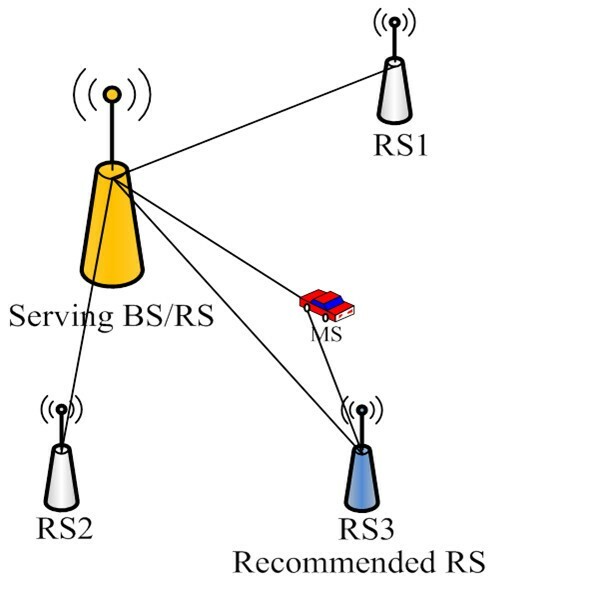 The RS is not directly connected to the wired backhaul and is responsible for relaying data between the BS and the MS. An RS can be deployed on the tower and have sufficient power to transmit the signal. The function of the RS is considerably less complex than that of the BS. Hence, the RS deployment cost is also expected to be much lower compared with that of the BS. The MS will directly communicate with a BS or through an RS. When the MS is far away the BS or the signal strength is poor between the BS and the MS, the MS can switch to the RS and can relay its data to the BS. In this article, we focus on handover scanning overhead analysis based on the random mobility environment, where the MSs can randomly move in the wireless network systems. Figure 2 shows the handover in IEEE 802.16j multi-hop relay network systems, where the handover scenarios are classified into intracell handover and intercell handover with the HHO technique . In Figure 2, MS1 and MS3 result in the intracell handover, while MS2, MS4, and MS5 result in the intercell handover. Handover in IEEE 802.16j multi-hop relay network systems. When an MS roams in the multi-hop relay networks, it must obtain the information about the neighbor BSs or RSs to prepare for switching from the current serving BS/RS to the new BS/RS. As the signal strength is poor between the serving BS/RS and the MS, the MS must seek a suitable neighbor BS or RS to perform the handover. 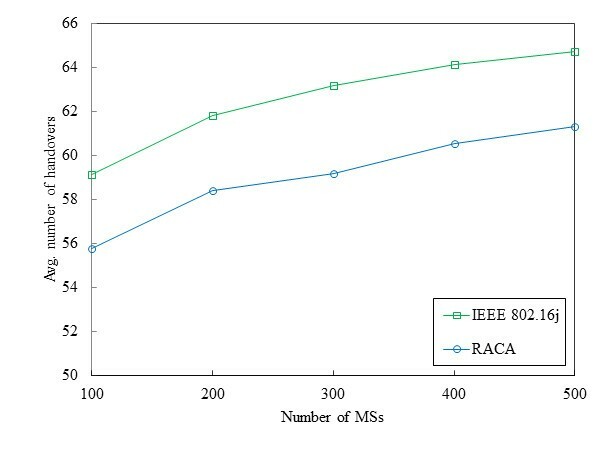 Figure 3 shows the handover signaling in IEEE 802.16j multi-hop relay network systems . The handover procedure includes two phases: received-signal-strength (RSS) measurement and handover decision phases. In the RSS measurement phase, the MS scans the suitably neighbor BS/RS to be a target BS/RS for handover by using the Measurement_REQ (MOB_SCN-REQ) and Measurement_RSP (MOB_SCN-RSP) messages. 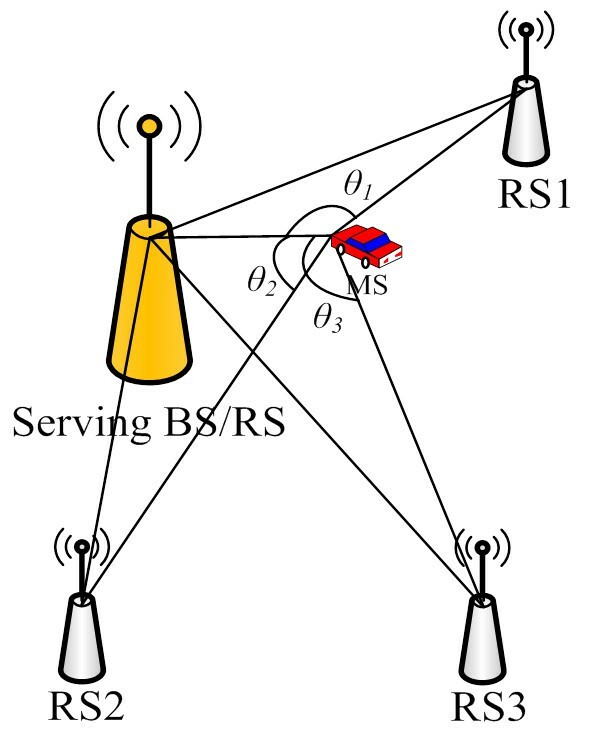 An MS cannot receive data packets from the serving BS/RS during the RSS measurement for the neighbor BSs and RSs. 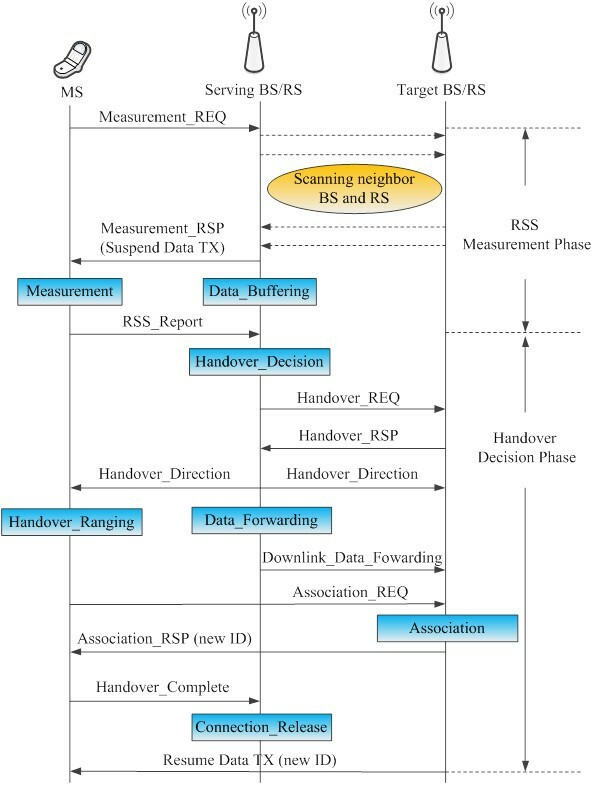 The RSS measurement overhead increases because an MS should measure the RSS of the neighbor BSs and RSs. Therefore, the network systems need more time to handle the scanning BSs and RSs when the number of BS and RS increases. It results in more overhead in the handover scanning procedure. 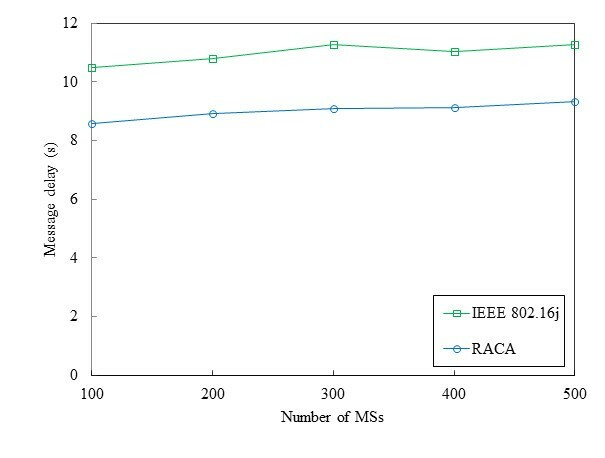 The message delay caused by handover can be increased in IEEE 802.16j multi-hop relay network systems. The QoS of the connection between the BS/RS and the MS is affected by the handover scanning procedure. The handover decision is based on the RSS measurement result. When the serving BS receives the RSS_Report message from the MS, it determines the handover execution. The MS will switch to the new BS/RS where the signal strength is the best between the new BS/RS and the MS. However, these networks have the inherent problem of rapid handovers due to the random movement of MSs. In addition, the moving direction of the MS does not necessarily go forward to the new BS/RS with the best signal strength in the future. The additional handover occur between the BS and the RSs or between two different RSs. It results in serious ping-pong problems and increases signaling overhead. Hence, the handover procedure must be improved in IEEE 802.16j multi-hop relay network systems. This article focuses on the RSS measurement phase to reduce the unnecessary associations and scanning intervals. Handover signaling in IEEE 802.16j multi-hop relay network systems. where P t is the transmission power, P n is the thermal noise power, f is the center frequency, c is the speed of light, and d is the distance between two communication nodes. The SNR value can be obtained in the RSS measurement phase in order to determine the handover execution. The distance between two communication nodes can be calculated based on the SNR value. Seven MCS in IEEE 802.16j network systems. In order to accelerate the handover process and reduce the transmission interruption, efficient handover scanning procedure schemes and corresponding algorithms must be developed. Based on the moving behavior of the MS, and the distances among the MS, the RS, and the BS, we propose a novel RACA to accelerate the handover process. 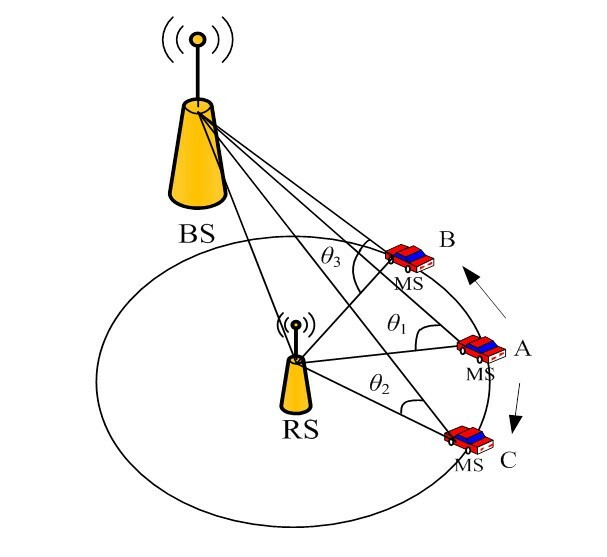 The main idea of this algorithm is to reduce the management information overhead and to estimate the potential moving path of the MS in the wireless mobile communication networks. Figure 5 shows the example of possible moving path of the MS, where the distance between the RS and the MS is the same in positions A, B, and C. It is clear that the moving direction of MS is hard to estimate when we only consider the distance (i.e., signal strength) between the MS and the BS/RS. In order to accurately estimate the moving direction of the MS, some angles are calculated according to the distances among the MS, the RS, and the BS. In Figure 5, when the MS moves from position A to position B, we can observe that θ3 is larger than θ1. In other words, when the MS moves from position A to position C, θ2 is smaller than θ1. Based on the changes of angle, distance, and moving speed of the MS, the potential moving path of the MS can be estimated. Example of possible moving path of the MS.
θ r = cos − 1 d SBRS , MS 2 + d MS , RS r 2 − d SBRS , RS r 2 2 × d SBRS , MS × d MS , RS r .
Figure 6 shows the example of the angles among the MS, the RSs, and the serving BS/RS, where the number of RSs is equal to three. The distance between the MS and BS/RS changes with the time. Therefore, the angles also changes. Figure 7 shows the example of the new angles among the MS, the RSs, and the serving BS/RS when the MS moves. Example of the angles among the MS, the RS, and the serving BS/RS. Example of the new angles among the MS, the RS, and the serving BS/RS. Example of moving distance of the MS.
We employ ε t n as a speed parameter to adjust the measurement function ω RS r , t n . When α RS r , t n > 1 and β RS r , t n < 1 , ε t n is equal to δ MS , t n . It means that the MS goes forward to the RS r with a high opportunity. In contrast when α RS r , t n < 1 and β RS r , t n > 1 , ε t n is equal to − δ MS , t n . It means that the MS goes forward to the RS r with a low opportunity. An initial fully scanning process is required after the handover in order to re-calculate the measurement function ω RS r , t n in our proposed scheme. We employ the measurement function ω RS r , t n to select the recommended RS for the MS. The recommended RS is an RS with the largest ω RS r , t n . The recommended RS will become the target RS in the next handover. Hence, only one RS is required to scan and measure during the RSS measurement phase in the handover process. It can reduce the management information overhead and can eliminate the unnecessary associations and scanning intervals. Therefore, the handover process can be accelerated. Figure 9 shows the example of the recommended RS for the MS by using the measurement function of our proposed scheme according to the Figures 6 and 7. In addition, due to the user’s mobility, an MS may slow down or stop to go to other direction. Hence, the speed parameter ε t n is employed to adjust the measurement function ω RS r , t n . When the MS slows down, v MS , t n is decreased. Hence, ω RS r , t n is also decreased and a fully scanning process is required in order to accurately re-estimate the possible moving direction of the MS. Example of the recommended RS for the MS.
Due to an MS roams in the multi-hop relay networks, it must obtain the information about the neighbor BSs or RSs to prepare for switching from the current serving BS/RS to the new BS/RS. As the signal strength is poor between the serving BS/RS and the MS, the MS must seek a suitable neighbor BS or RS to perform the handover. Hence, the BS periodically calculates the SNR level and sends the information about the neighbor BSs or RSs to the MS in IEEE 802.16j systems. 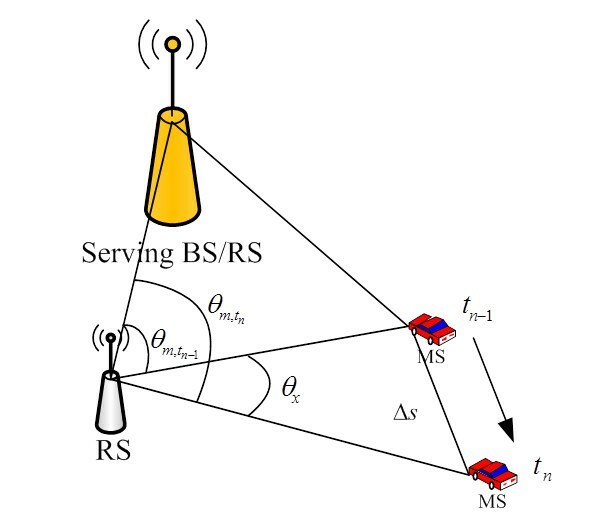 An MS cannot receive data packets from the serving BS/RS during the RSS measurement for the neighbor BSs and RSs. The RSS measurement overhead increases because an MS should measure the RSS of the neighbor BSs and RSs. Therefore, the network systems need more time to handle the scanning BSs and RSs when the number of BS and RS increases. It results in more overhead in the handover scanning procedure. In our proposed scheme, the measurement function is also periodically calculated by the BS and sends the information about the recommended RS to the MS for scanning. We eliminate the unnecessary associations and scanning intervals, and reduce the handover scanning procedure efficiently. The required computing time for handling the MS to switch the current serving BS/RS to the new BS/RS is also reduced. Based on the moving behavior of the MS, the proposed scheme makes an adaptive decision for dealing with the handover process. The simulation environment is composed of 100 cells and a BS is fixed and located at the center of each cell. The coverage radius of the BS is 5 km. The positions of the RSs are randomly distributed in the cell. For each cell, the number of RSs is equal. The coverage radius of the RS is 1 km. The numbers of RSs are 10, 30, and 50. The RSs are determined by RS deployment strategy which is out of the scope of this article. The location of each MS is randomly distributed in each cell at the initial state. The numbers of MSs are 100, 200, 300, 400, and 500. The speed of each MS is uniformly distributed between 0 and 120 km/h. The moving situation of each MS is random movement within the geographic area. The average time to measure the RSS for a BS or RS is 5 ms and the average time for the handover decision phase is 110 ms . The distances between MS and serving BS/RS and the RSs are estimated based on the coding rate and receiver SNR as shown in Table 2. Figures 10, 11, and 12 show the average number of scanned RSs when the number of MSs varies from 100 to 500 and the number of RSs in each cell is 10, 30, and 50, respectively. It is observed that the average number of scanned RSs of IEEE 802.16j standard scheme is higher than that of our proposed scheme. According to Figures 10, 11, and 12, it is evident that different numbers of RSs in the cell result in different numbers of scanned RSs for the MSs. 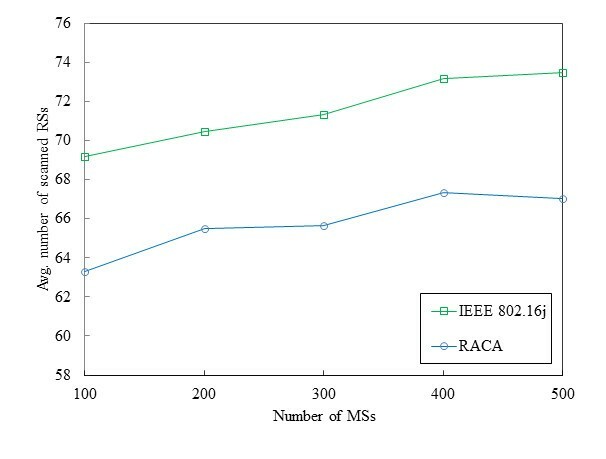 For the three figures described above, the total number of scanned RSs of IEEE 802.16j standard scheme is approximately 426. However, the proposed scheme achieves a total average number of scanned RSs that is approximately 285. This is because too many unnecessary scanning of the target BSs or RSs result in more number of scanned RSs for the MSs in the IEEE 802.16j standard scheme. It means that the network systems need more time to negotiate the association parameters and to handle scanning the BSs and the RSs in the handover process. 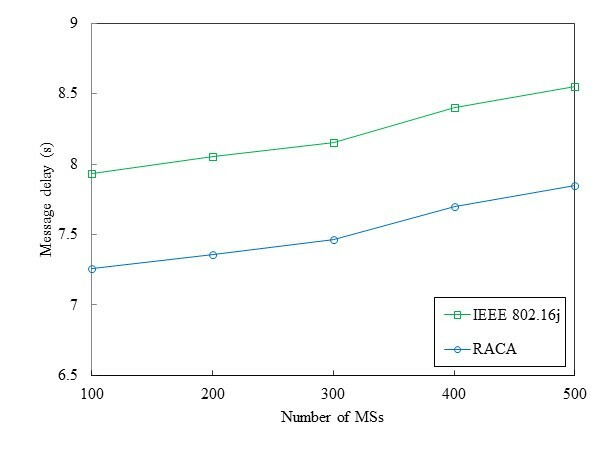 In contrast, our proposed scheme estimates the potential moving path of the MS by using the RACA, which reduces the unnecessary scanning of the target BSs or RSs efficiently. Average number of scanned RSs (RSs = 10). Average number of scanned RSs (RSs = 30). Average number of scanned RSs (RSs = 50). Figures 13, 14, and 15 show the average number of handovers when the number of MSs varies from 100 to 500 and the number of RSs in each cell is 10, 30, and 50, respectively. It is observed that the average number of handovers increases with an increase in the number of MSs. The average number of handovers of the two schemes exhibit similar trends. 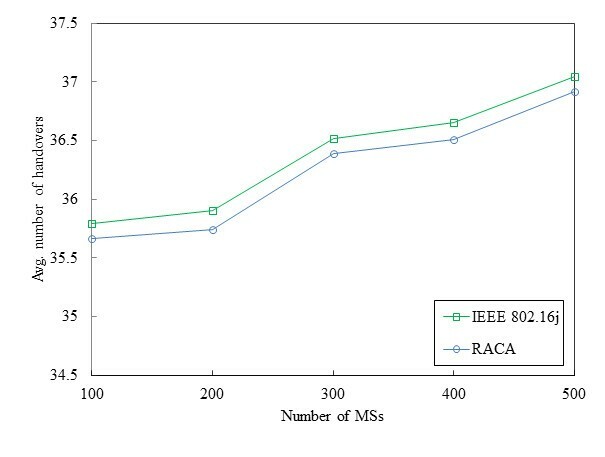 However, the average number of handovers for IEEE 802.16j standard scheme increases noticeably when the number of RSs in each cell increases. Due to the improved handover process approach in our proposed scheme, the average number of handovers of our proposed scheme is less than that of IEEE 802.16j standard scheme over various numbers of MSs. 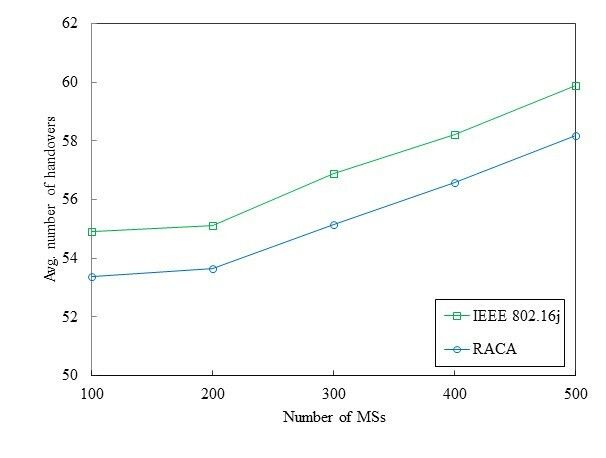 For example, when the number of RSs in the cell is 50 and the number of MSs is 500, the proposed scheme achieves the average number of handovers that is approximately 3.5 lower than that of IEEE 802.16j standard scheme. The reason for this behavior is that the suitable target BS or RS can be recommended by using the proposed algorithm. It results in a lower average number of handovers. Average number of handovers (RSs = 10). Average number of handovers (RSs = 30). Average number of handovers (RSs = 50). Figures 16, 17, and 18 show the average message delay when the number of MSs varies from 100 to 500 and the number of RSs in each cell is 10, 30, and 50, respectively. It is evident that the average message delay of our propose scheme is lower than that of IEEE 802.16j standard scheme. 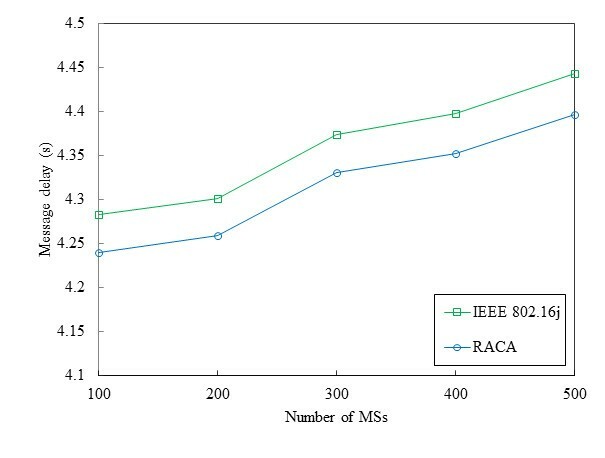 From the simulation results, it is clear that our proposed scheme achieves superior performance for varying number of MSs in the handover process for IEEE 802.16j multi-hop relay network systems. The main reason is that the proposed scheme makes an adaptive decision for handling the handover process based on the moving behavior of the MS, thus can effectively deal with the sudden traffic surges. The handover process can be accelerated. Therefore, the message delay time caused by transmission interruption can be reduced. This shows that our proposed scheme is promising and more suitable than IEEE 802.16j standard scheme in a multi-hop relay network system. Average message delay (RSs = 10). Average message delay (RSs = 30). Average message delay (RSs = 50). Handover process is one of the important components for QoS sensitive wireless networks. In order to accelerate the handover process and reduce the transmission interruption, efficient handover scanning procedure schemes and corresponding algorithms must be developed in an IEEE 802.16j multi-hop relay network system. In this article, a novel RACA is proposed to estimate the potential moving path of the MS by taking into account the moving behavior of the MS, and the distances among the MS, the RS, and the BS. The management information overhead can be reduced and the handover process can be accelerated. Simulation results indicate that our proposed algorithm achieves the low handover overhead and the low message delay in the IEEE 802.16j multi-hop relay network systems.